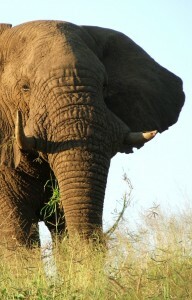 Elephant in Hluhluwe-iMfolozi Game Reserve, South Africa. Photo credit: Chris Kelly. Frighteningly, resurgent ivory demand threatens elephant with extinction over large areas of their range. It is a world-war for wildlife on a massive scale. Governments, conservation agencies and private landowners are mobilised across Africa and Asia spending enormous amounts of money to protect elephant. I hope they win the war so that our children can live in a world with big, magnificent animals. Auckland Zoo is hoping to import two elephants at a cost of about $3.2 million. Franklin Zoo is trying to raise $1.45 million to send an ex-circus elephant which recently killed its keeper to a sanctuary in the USA. Hamilton’s Gully Restoration Program to bring wildlife back into the city cost just $65,000 but its budget was cut by $20,000 earlier this year, although only 1.6% of Hamilton’s ecological district remains in native vegetation. Zealandia, New Zealand’s first fenced mainland biodiversity sanctuary, needs just $700,000 a year to continue to protect and advance the biodiversity gains of Wellington City, but has been under severe budgetary scrutiny. Ironically, Wellington and Hamilton City’s ecological restoration projects cost less each year than sending Hamilton’s single elephant to the USA. The $4.65 million to import two elephant and export another would support the annual operating costs of six Zealandias and 67 large-scale biodiversity restoration projects by communities, like Hamilton’s Gully Restoration. Imagine it – a mainland wildlife sanctuary and city-wide ecological restoration project in every major city and large town in New Zealand bringing the forests and birds back to our cities and our grandchildren. At least 2788 New Zealand species are threatened with extinction. New Zealand has one of the world’s worst records of habitat loss and species extinction. We could reverse that trend by protecting and restoring habitat, but we are limited by a lack of funds. The cost of importing and exporting three elephant compared with expenditure by community groups and government to protect and restore New Zealand’s native plants and animals. The cost of shipping just three elephant is also as large as the annual biodiversity and biosecurity budgets of Auckland City and Wellington Regional Council to protect and enhance native ecosystems on land, in our rivers, estuaries and along our coasts, and prevent the spread of invasive pests that threaten our nation’s economy (see graph above). The $4.65 million for just three elephants is also almost half as much as the Department of Conservation’s $10 million NZ Biodiversity Fund supporting biodiversity protection by landowners and communities nationwide. Zoos make claims that elephants are important conservation advocates but the war for elephant is largely someone else’s war. We should not pretend to fight the world war for wildlife in trivial ways in our zoos while losing battles at home – like sending troops to a defend a country on the other side of the world while another threatens our own shores and families. New Zealand’s biodiversity problems cannot be addressed by more elephants in zoos, but might be with ecological restoration and conservation advocacy based on native habitat and species in the places we live, work and play. Our priorities for conservation advocacy could be better addressed by community restoration projects like Auckland’s Kaipatiki Project or Hamilton’s Gully Restoration, and mainland wildlife sanctuaries like Zealandia in Wellington. Instead of donating funds to move zoo elephants, consider donating to protect NZ Sea Lion or Maui’s Dolphin, eradicate mice on the Antipodes Islands (the Million Dollar Mouse Project), or plant the banks of your local stream with native vegetation for our native birds, reptiles, and fish. Elephant are magnificent, but so is waking up to the call of kokako, summers swimming in clean beaches and rivers, or watching a Hector’s dolphin crest a wave. Only the last three, however, are unique to New Zealand. Keeping elephants in NZ does not make economic or conservation sense. In a future post I will evaluate the reasons given by Zoos for having elephant in NZ and seek evidence for their claims.